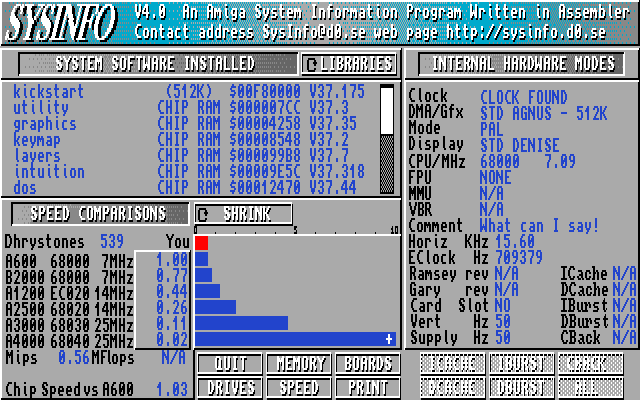 SysInfo is an application for Motorola 680x0 based Classic Amiga and is used for getting information about the system like OS and library versions, hardware revisions and stuff. Exactly 19 years after version 3.24 of SysInfo it's time for an update! The original author Nic Wilson has kindly given me permission to continue the maintenance of this old classic. Download latest version (for directlinks, use this link to always get the latest version). I want more bug reports! Mail it to SysInfo (at) d0.se or use the contact form. Added some support for identificate of 68060, more to do. Doesn't yet handle the difference between LC/EC versions. New contact information: http://sysinfo.d0.se SysInfo (at) d0.se. The DRIVES/SCSI function was not 'Close'ing each drive that it 'Open'ed after the function was finished. Some invalid or strange devices could cause the DRIVES function to guru. This has been corrected. Added the ANSI version number of scsi drives to the SCSI function within the DRIVES function. This tells you if your drive is a SCSI-1 or SCSI-2 etc. NOTE, on A1200 or A4000 the IDE drive will return info that the Operating system interperets. I suppose it returns inforation, correctly translated as if it were a scsi drive. I will attempt to find out and report next version. Sysinfo displays the information given as if it were a SCSI drive. Added a SCSI 'TYPE' of '3' a processor device to the SCSI function. This was ommited from previous versions because of dispute as to the type of device a '3' was. Fixed a MAJOR bug in the display info. The bug would occur if for example the system was booted without a startup-sequence. This caused the program to totally hang or crash. Added a new function in the BOARDS section as many users have asked for. If SysInfo does not recognise a board by name, SysInfo will look in an external ascii file that you create, and try to find a match for each unknown card. Please see the README file for specific info on creating this file. Added the ability to split the 68020 and 68EC020 CPU's. So who said it couldn't be done eh?. Tests so far seem to indicate the routine works fine. Replaced the "DISABLED" and "ENABLED" strings for the MMU display with "NOT IN USE" AND "IN USE" respectively as some users seems to think that disabled, meant permanently disabled or a less than working version. Remember though that just because SysInfo states that you may have one, does not necessarily meant it is in a fully working state, some 68EC030's have an less than operational MMU that will partially work and SysInfo sees this as a working MMU. Added the ability to recognise kickstart that have been "ReKicked" and kickstarts larger than 512k. This information if found will be displayed in the scroll area beside the kickstart version. There was an error in the string for 25Mhz Amigas and this was forcing it to show as "25000". This has now been corrected and shows correctly as "25.00"
Even though the -p Print routine was working fine the internal print gadget routine was broken. I have fixed this and now it prints ok. Thanks to a good friend of mine, Andy Clay, a blatant bug has been fixed that has been in SysInfo since V3.00. The priority display in the Task and Port lists was shown as values between 0 and 255 instead of -128 to +127. This has been corrected and it now shows the correct value. Strange how it took this long for someone to notice such an obvious error. Thanks Andy. The Total Size memory field inside the Memory function was inaccurate and losing half a meg on some setups, this has been corrected. Corrected a problem for some IDE drives in the A4000. It seems that some brands of IDE drives do not like reads of 128K or greater at once and some users have not set their "MAXTRANSFER" value to $FFFF. The SPEED function of SysInfo tried to use a 128K read, so I have changed this to 64K. It fixes the problem for a Quantum IDE LP52 drive and I expect it should fix all others. Corrected an error in the drives function. It always used a read size of TD_SECTOR in order to fetch the first block of the boot sector. CD-ROM drives with 2048 bytes per sector did not like this. I have changed the read size to the id_BytesPerSector of the particular device being read. Fixed a bug in the dhrystones printing routine, any subsequent printing of the number could be wrong if it was much smaller (eg. caches off) because the number was not erased first, and part of the old number was left behind. Fixed the "lies" of CLOCK function, it should now correctly report if you have a Commodore compatible hardware clock or not. Older versions lied on the A1200 and A600. Fixed an error for the 68020 CPU. The "DCACHE" gadget was still enabled, even though the string correctly showed N/A. Now I have access to an A1200 I made the A1200 speed comparison slightly more accurate. Since re-arranging some of the strings in the main display I neglected the print strings and subsequently they were all mixed up. I have now corrected this. Was unfinished and I never personally released this version but some local person posted it and it ended up on Fish, I was most annoyed at this. Fixed a bug on the A3000, where a guru would result from using any of the cache gadgets after doing a speed test. Due to massive public demand, the Comment is back. Please take this as a tongue-in-cheek comment, it is not to be taken seriously. When the program loads my Logo is in the centre of the screen. The logo is a map of Australia, and if you look to right of the 'S' in 'NWS' you will see a star burst in the location of my home town 'Toowoomba'. Thanks to Kurt Boulter from Don Quixote Software for the logo graphics. Removed all the Memory amount displays from the main screen as it was rather redundant with the 'Memory' function gadget. This also allowed for larger and better strings for some of the other displays. Removed the DMAC display, as it looks like the revised chip will not be released. It seemed pointless to look for a newer chip if they are not going to release it. Six new gadgets to manipulate cache modes. This requires V2.0 AmigaDOS or later. See main doc for more info. Chip memory comparison has changed so the comparison is done against a standard A600 instead of an A3000. I have changed the MFLOP routine, the results have changed quite drastically and I am told that the results are more accurate. I would appreciate any comments on this. I accidentally put the free chip and free fast strings the wrong way round in the last version. This has now been corrected. Since hardware re-arrangement 68020 and 68030 Amiga's would hang, this is now corrected. I have temporarily removed the intelligence code from the MHZ result to try and overcome a problem. At the moment it will display the result exactly as calculated, I may leave it this way depending on your reports. Caches for the 68040 are now turned on for the MHZ speed test and returned to the original state after the test. I have now allowed leading spaces on the printing of addresses in order to align strings better. The choice gadgets at the bottom have been improved and now have a 3D look and feel when clicked. If printing results with the -p switch the program could sometimes hang or crash. This has been corrected. The VBR display would sometimes show a blank rather then zero if the VBR was set to address zero. This has been corrected. Further optimizations reduced code by another 10K this means that this version is about 26K smaller than version 2.66 was, CHIP memory usage is also further reduced. Removed the Write Allocation display to make way for RAMSEY, GARY and DMAC chips versions. WR ALLOC wasn't a very useful anyway. GARY, RAMSEY and DMAC are much more useful and newer versions of these chips are starting to emerge. See main doc for more information. With more optimizations of the code, I managed to remove around 16K from the program size. These changes also cut down the CHIP memory usage by about 20K. Since the repair of the recognition routine I have now re-added the ability to do a wildcard search for hard disks, so that the actual device driver name need not be known in some cases. I also added case-insensitivity to this new recognition routine. Due to popular demand I added the VBR register address to the hardware modes display. See VBR under Hardware modes in the main doc for more information. Due to a request from a 68040 board manufacturer, the INS BURST and DAT BURST now show 'ON' rather than 'N/A' on the 68040. Added some further interrogation of exec DeviceList in order to extract unwanted devices, and display only the wanted ones. fixed a MAJOR bug in the hard disk recognition routine that could either see your drive as 'Other' or crash your Amiga. fixed a MAJOR bug with any Amiga with a memory expansion card. the program could hang, crash or give strange results. This bug occured before the SysInfo screen was open, so would give symptoms of an immediate crash. This was the cause of the failure on the GVP 68040 card and the PP&S Mercury card. Since adding 68040.library string I neglected to add it to the print routine, meaning that the print string was out of alignment. Standard Amiga MHZ has been made more accurate. Software strings have changed, from showing 'VERSION' to 'LIBRARY' so there is no confusion over the new entry '68040.library' version. When a 68040 processor is found a check is made to see if your 68882 emulation library is installed and working correctly. If so the 'FPU' string will show '68040+68882', else it will only show the 68040. If you find this is the case, contact your board manufacturer and ask for the Commodore 68040.library and Setpatch V37.2 or greater. Many manufacturers software supplied with their cards was either incorrect or broken. I swapped the identification of the XT and AT bridgeboards as I have been informed over Email that they were backwards. Although as usual this is untested by myself. Graphic and text changes to improve SysInfo's look. A dozen new boards added to the autoconfig recognition function. All from German manufacturers. Minor bug fixes and optimizations. Drives function could crash if an IBM formatted disk or some other formatted non AmigaDOS disk was in a floppy drive and that floppy selected. This is now fixed. Copyback mode now checks both of the data transparent translation registers to see if this mode is enabled. It does NOT check the ATC tables. re-wrote the CHIPSPEED vs A3000 routine to speed it up for slower Amigas. Your SysInfo -t 'rating' result will be a smaller value now because the test now completes in much less time. The on screen result should change little if any, except that 68040 CPU's will be a little more accurate now. Fixed a bug that caused the print routine to fail if used a second time. Drives function now checks device driver name with wildcards so it will be able to identify some actual hard disks instead of 'other'. This check looks for the word 'scsi' somewhere in the device driver name. Changed the calculation of the 'ACTUAL' drive size within the DRIVES/SCSI function, as it could fail on certain brand drives or versions that did not fill in the RDB properly. Hopefully this new code will work correctly even on those drives. With modifications to the image data for the various windows, SysInfo's size was shrunk by over 30%. Accuracy of timing improved slightly by waiting for top of frame before starting the verical blank interrupt for each speed loop test. Because Commodore used the same ID numbers for the AT and XT bridgeboard, it meant that the boards function couldn't seperate the two. Thanks to Klaus Berkert a new function in this area should be able to seperate the two. I have not tested it due to the fact I do not have either brigdeboards. I would be grateful if someone could test it an email me the results. The last couple of versions had a bug that crept into the Chip speed vs A3000 test. It was giving incorrect results. This has now been corrected. A few new boards added to the recognition routine. The program is now being assembled with Macro68. Fixed an old old bug. If workbench was not loaded the N/A string for the library base would print in the wrong position. Fixed a bug in the -t routine, the program would crash if you didn't have a floating point unit. Made the memory free amounts on the main screen much more accurate reflection of memory free, as if SysInfo was not running. Print window now has the heading string gadget automatically activated. If exec.library is found to be reflecting the incorrect hardware, a window will now open and ask if you want it updated to be correct. Previously it was changed without user knowledge. The screen information will always be correct regardless of settings of exec.library. I added support (in theory) for the 68EC040 processor, This is a special version of the processor without MMU or FPU. I have never seen one of these so the routine is untested, but the theory is sound. Changed the MFLOPS routine to stop 68881's used via the resource from crashing. Until I do a new routine specifically for this it will show N/A beside the MFLOPS speed test. Enforcer was complaining about one of my routines that was perfectly ok. I changed the code to stop it complaining. Changed the comments again(just to keep you people guessing). The program has undergone extensive changes to be compatible properly with the 68040. Copyback mode is now fully supported both in the programs execution and the copyback display mode on the screen. Rewrote the MIPS code, added a few more boards to the recognition routine. Many users were taking offence at the tongue-in-cheek comments. These were only meant to be amusing, but now thanks to my seven year old eldest son, you now have a full set of Ninja Turtle comments. I will continue to change them from time to time to keep you all amused. Fixed a bug in NTSC Amiga. Very sorry you guys and gals but all Amiga's in Australia are PAL and I never tested the NTSC routines. SysInfo was reporting NTSC 2MB Agnus as a 1MB Agnus. This was a silly mistake on my part and is now fixed. Rearranged the screen to delete obsolete functions. XT/AT test and total autoconfig boards are gone as they are now handled in the 'boards' gadget function. Hardware Clock has been moved to the Memory Area to create room. CIA Test and comment fields have been moved to this newly created area, allowing for more fields that are speed orientated. Due to popular demand the IBM comparison is now back, and a new CPU MIPS and FPU MFLOPS fields. See the main docs below for more info on these. Fixed a major bug in the instruction and data cache code for 68020, 030 processors. If caches and bursts were off when SysInfo was launched it could leave them on after exit. The MHZ speed could be incorrect if caches and bursts were off. This is now fixed and all are reset to their original condition immediately after the MHZ test. Fixed a bug in the drives function that was crashing some 16 bit Amigas. I accidentally left a half finished new routine in the drive type field. This was a mistake on my part and has now been removed. The mouse is now ALWAYS be blanked while frozen, and will now immediately return when unfrozen without requiring movement. The new autoconfig recognition feature has become quite interesting. Some users have told me it was recognising some boards as the wrong brand etc. It has turned out that some boards around seem to be using 'stolen' autoconfig roms. I don't suppose they knew SysInfo would come along and find them out. I suggest that manufacturers use SysInfo to find out if a particular rom on a particular card needs further investigation. New revolutional function added. Within the 'Drives' function window is a new gadget called 'SCSI'. This displays info as supplied from the drive itself. It displays the actual drive size in Megabytes. This allows comparison of the real size and the size it is formatted too, or the size you believe it was. This may not work at all for some brands as they do not support the required comands, see 'SCSI' under the 'DRIVES' function. Fixed a bug that would leave multitasking off if no hardware clock was found. On 68010 processors the printing function would guru after a few lines, I beleive this is fixed but not tested. Please let me know if there is further probs. Please report any bugs and feature requests to SysInfo (at) d0.se. Do you want to be a beta tester? Contact SysInfo (at) d0.se, please include your system specs. Unfortunantely no support for PowerPC, not yet. sysinfo does not see the PowerPC processor? Could you please expand the machine results box by 1 or 2 character in the "speed comparisons" section and also expand the mips results by 2 chars so ppl using high speed emulators dont get their results displayed wrong/chopped off, it would be nice to see them even though the numbers are inacurate in emulators. Still no license, unfortunately. If you have any contact path with the current license owners, please contact me. I have not received a response for a long time. Hi, Do you have an beta ADF version or an official version ready now? If you happen to pass by our lovely capital, you're most welcome to visit the SUGA clubhouse, open every Saturday from 15:00. Check out www.suga.se for directions. I'm sure you will find both inspiration and access to odd and rare hardware. i would like to make a patched (for Vampire & non fpu) and standard version of sys info on .adf and upload it to Aminet. would have a problem with this cheers mike. Please, don?t distribute any .adf! SysInfo requires SetPatch to work properly on many configurations and I?m in the process of obtaining a license. I have a .adf solution ready as soon as I have the license. You can contact me if you want to join a closed beta. To use this programm on an Amiga 2000 I would need an adf file, so this is not provided? It would be nice to have also an adf download, like sysinfo.adf. That would be more straightforward to use from WinUAE without a virtual harddisk. where can i find the number to dial 'Phone Me NOW!!!' ? Screen promotion doesn\'t work properly if being used on an Amithlon system. Graphics are shrunk and buttons are corrupted in Ver. 4.0. Muchas gracias, esperamos que actualices a las nuevas aceleradoras de A600. Great job! Thank you a lot!